Reek Day coincides with the old pagan festival of Lughnasa, and on this day thousands of pilgrims still make the 3hr 30min climb to celebrate Mass at the summit, many of them barefoot and fasting! 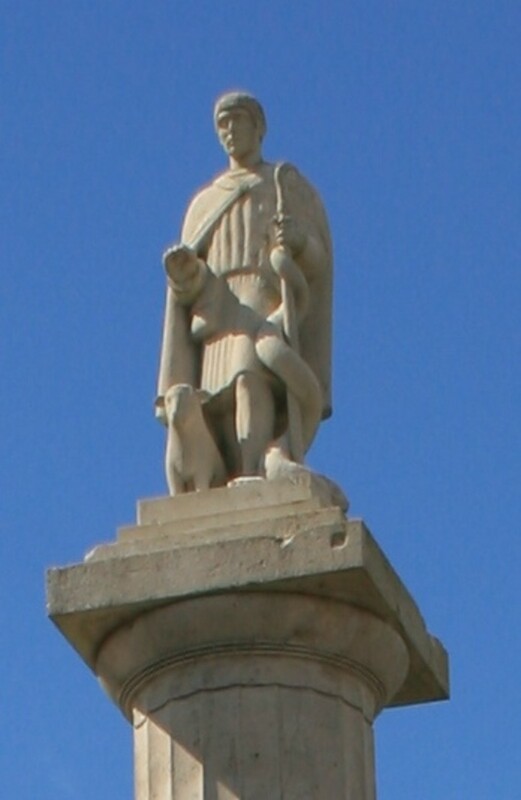 The pilgrimage commences at the village of Murrisk, and the first main point of interest on the path is a statue of St. Patrick. Prayers are said here by many of the pilgrims, and it's also a stop off point for many who can't finish the ascent. Further along the path, there are three pilgrimage stations, each of which has a sign with instructions for the proper rituals and prayers. On July 27th 2009, The Irish Times reported that only around 15,000 pilgrims made the climb this Reek Day due to blustery high winds and intermittent rain. The numbers were well down on previous years due to the poor weather conditions, but the mountain was busy throughout July, as regular pilgrims chose finer days to make the climb. Enterprising locals offered walking sticks for sale at the foot of the mountain, and as the terrain can be rough-going and shaley, these are probably a worth-while purchase! There's a great camaraderie amongst the pilgrims, and many are regulars, coming back year after year, to make the journey up to the little chapel at the top, which was built in 1905 and took twelve men six months to complete. At the top, pilgrims are amply rewarded for their efforts. The views from the peak are stunning. On a clear day you can see the Twelve Bens in the south, and the mountains of Achill Island in the north. Croagh Patrick itself is not particularly spectacular as mountains go, but you certainly can't say that of the surrounding scenery. This part of Ireland is particularly beautiful, and one of the true gems of the area must be Clew Bay. 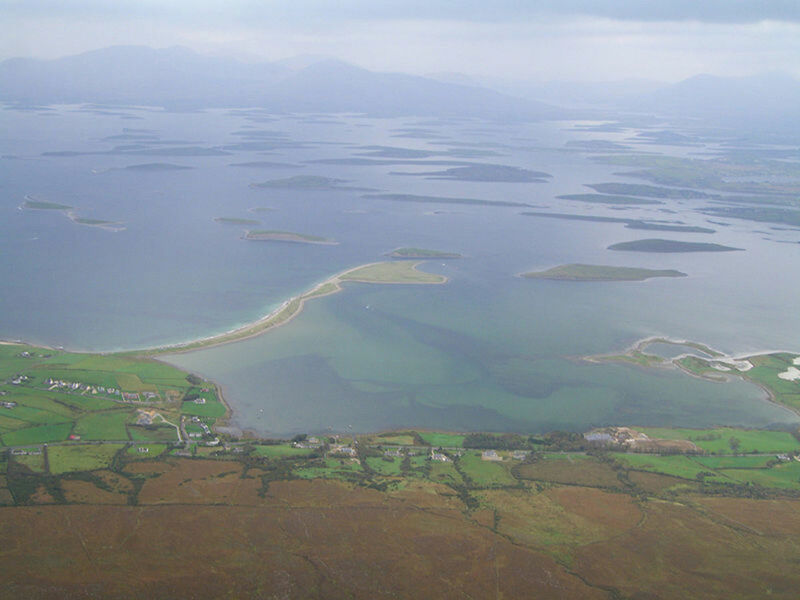 The English 19thc novelist William Makepeace Thackery visited the area in 1842, and on seeing Clew Bay he wrote, " The islands in the bay, which was of gold colour, look like so many dolphins and whales basking there." My own first view of Clew Bay was of islands appearing through the mist, and yes , they did look like a shoal of huge aquatic mammals! There are literally hundreds of small islands and islets off the coast here, ranging from rocky outcrops, right through to the biggest of the Irish off-shore islands; Achill Island, a favourite Irish holiday destination. Many of the rocky outcrops are actually drowned Drumlins, long hills formed by glaciers during the last ice age 10,000 years ago. Clew Bay has also attracted it's share of unexpected visitors. In 1999 a walrus was photographed on the rocks sunning itself. The creature was obviously a long way from home, but it's not the first such sighting off the Irish coast! The Quay at Westport, an architectural gem in it's own right, looks out towards the bay, and is home to the Clew Bay Heritage Centre, which houses an eccentric mix of photos, farming implements, old coins, and other random objects. 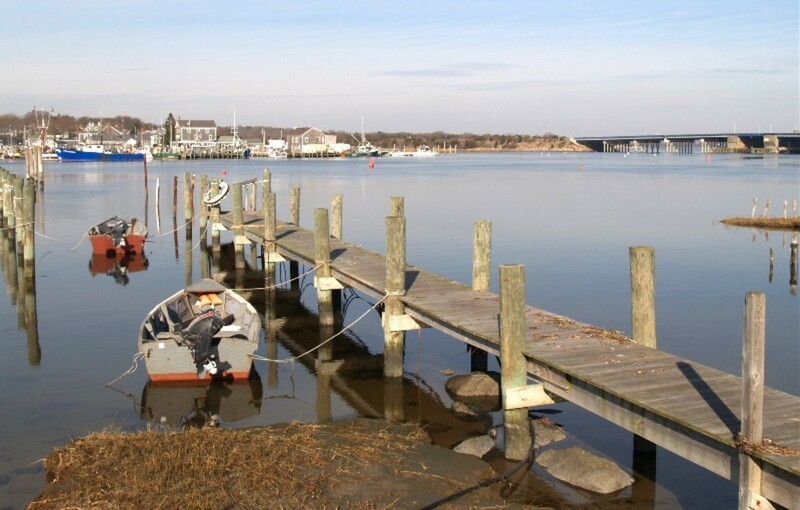 In the summer walking tours of the historic town of Westport are arranged from here. There are also a number of restaurants, pubs, and gift shops at the Quay. We enjoyed a particularly fine meal at one of them, The Asgard, which faces the sea front, on our last visit here. The pretty, Georgian, sea-side town of Westport offers holiday makers a warm, Irish welcome, and it has become a magnet for visitors from all over Europe in August each year, when it hosts a very lively music festival. If you're planning to come and sample the musical and artistic delights on offer, you'd do well to book in advance, as accommodation can be hard to come by in the summer months. 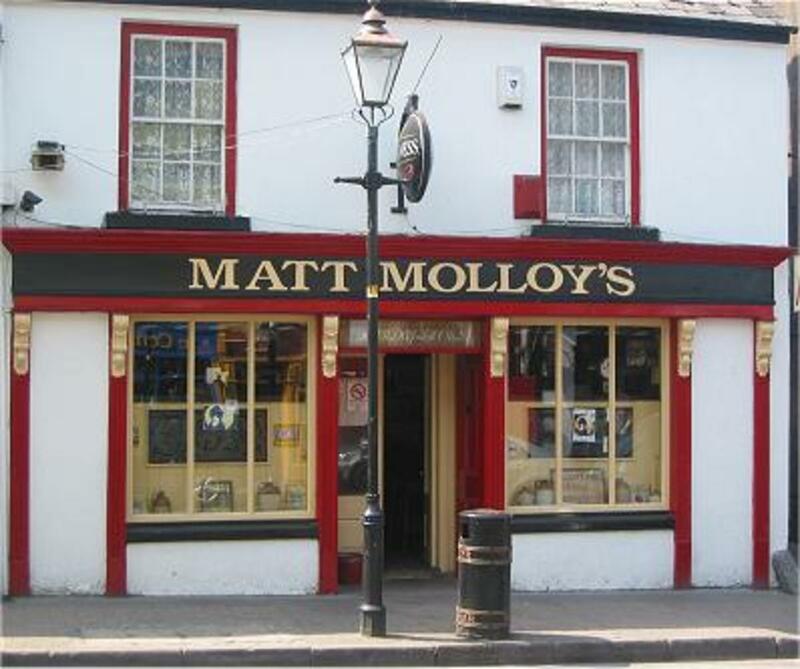 A popular destination on the tourist trail is Matt Molloy's pub, where the best of Irish live music can be found and enjoyed in an intimate setting, and accompanied by a pint of Guinness if you so wish. Outside there's fabulous grounds with a playground for children, a pitch and putt, a log flume, and a train ride round the park. 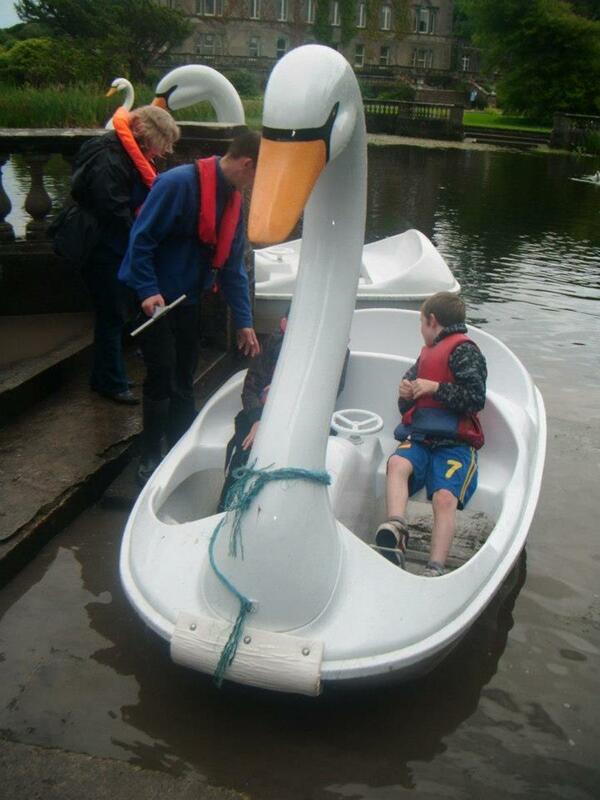 The house overlooks a beautiful lake, and there are boat rides available in swan shaped pedallos. A soft play area known as 'Pirate's Den' is housed in a separate building close to the pitch and putt, and it offers indoor entertainment for children on rainy days throughout the year. Outdoors, the many activities are now branded together as Pirates Adventure, although most of these are closed in the winter months. There is nothing stuffy or boring about Westport House. The owners themselves have a large family, and a great deal of effort and ingenuity is employed to guarantee that a good time is had by visitors of all ages. Campers and caravanners are made welcome here, and the pitch price includes access to a good deal of the Westport House facilities. Knock Airport (see map above) is the nearest Irish airport to Westport, and is around a 45 minute drive away from Westport. Knock has flights to and from the UK on a regular basis, and also has a good selection of car hire companies on site. UK airports served by flights from Knock include London Gatwick (Aer Lingus), London Stansted, and London Luton. Be aware, however, that it is a small airport, and the on-site catering facilities in the departure lounge are extremely limited. There is hot food available, however, it's expensive and not amazing, especially if you are a vegetarian! If you are due to check in at lunch-time, take food with you, or eat before you arrive there. 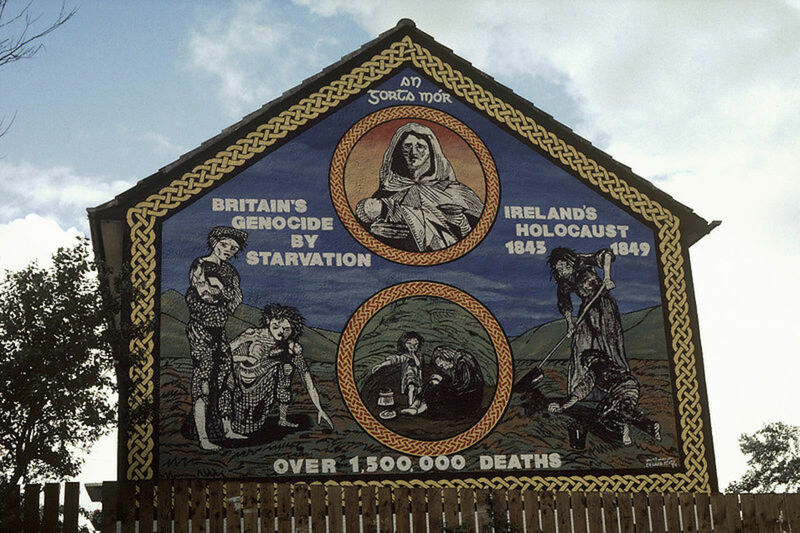 Knock itself, has no small claim to fame, being a site of pilgrimage since miraculous sightings of the Virgin Mary, accompanied by St Joseph and St John, began to attract visitors to this quiet Irish town in 1879. As a site of Catholic pilgrimage it ranks right up there with Lourdes and Fatima! WOULD YOU LIKE TO WRITE ON HUBPAGES? IF You haven't yet joined then why not SIGN UP WITH HUBPAGES TODAY? HubPages membership is totally FREE - So get writing, make friends (and if you want) Make Some Money! Paint-balling on wild and rugged terrain at Knappagh, just a couple of miles outside Westport. There is also an assault course, and bubble football facility available for hire here. 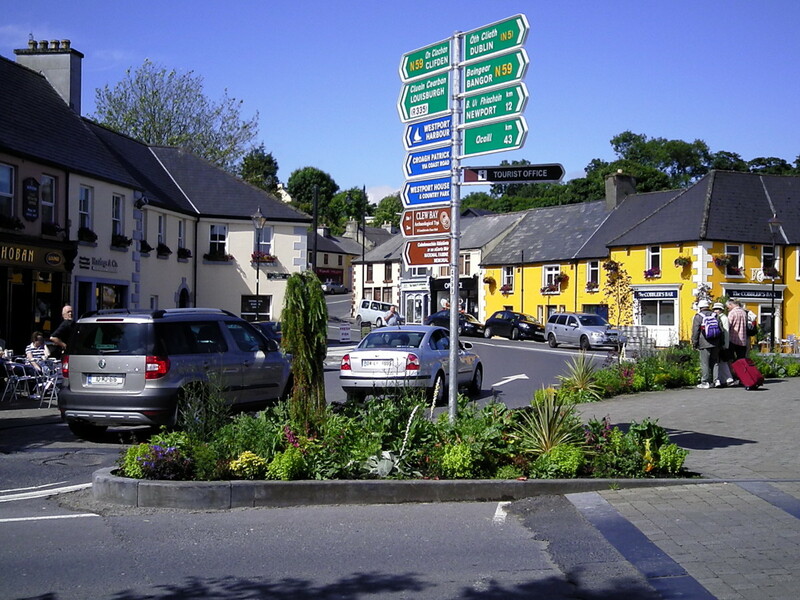 Westport and the surrounding area is very well served with a great variety of hotels, B&Bs, holiday cottages, campsites, caravans for rent, and all manner of self-catering accommodation. This is a reflection of it's popularity as a holiday destination, and the huge range of leisure activities on offer locally. The town also has a fine selection of eateries with something available to suit most tastes. The restaurants and pubs on Westport Quay offer wonderful, locally caught fish and seafood, and The Asgard restaurant is a personal favourite. But of course the great thing about a holiday in Westport, just as with any holiday on the Emerald Isle, is the warm Irish welcome. Hi Thelma, I've never actually lived in Ireland, but I have always loved my holidays there. The scenery is so beautiful, and the people are lovely too. I agree that the weather can be harsh, particularly in the Winter, but I guess you can't have everything! Happy Easter to you too! Hi Amanda! It´s a great Hub. I have lived in Ireland for 2 1/2 years and it was wonderful. 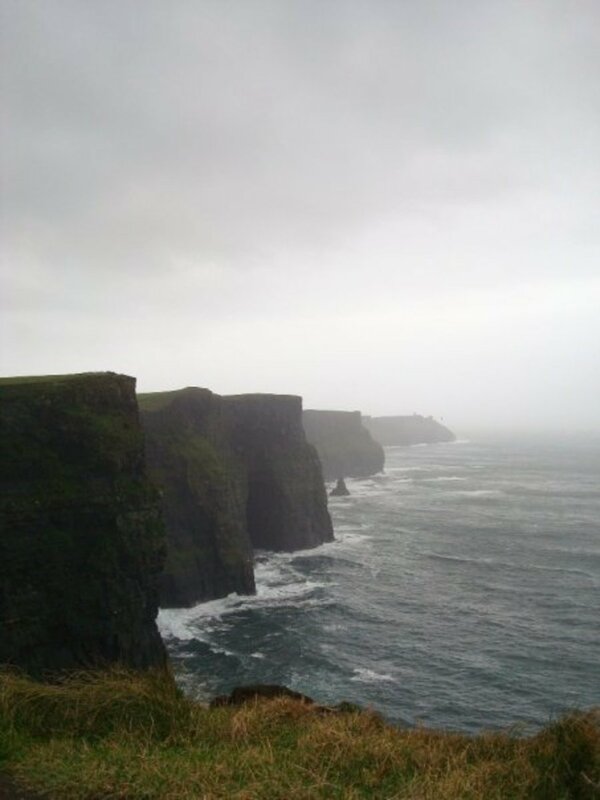 The landscapes are very amazing.The Irish people are very friendly, too. I have been to Westport, Achill Island and many others. I´m missing it now. I could have stayed there longer if the weather was a bit milder.Happy Easter! Thanks Failtetours, I have family just outside of Westport, and it's a really lovely area. Well you have done a great job in promoting the "West" and I am sure that anyone reading would add it to their wish-list. I have family at Knappagh and at Westport, though living in the UK, I don't see them as often as I'd like. I love Westport House. It's a great day out with the kids, and Matt Molloy's music always brings back happy memories of mis-spent hours sitting nursing a guiness! Beautifully done! 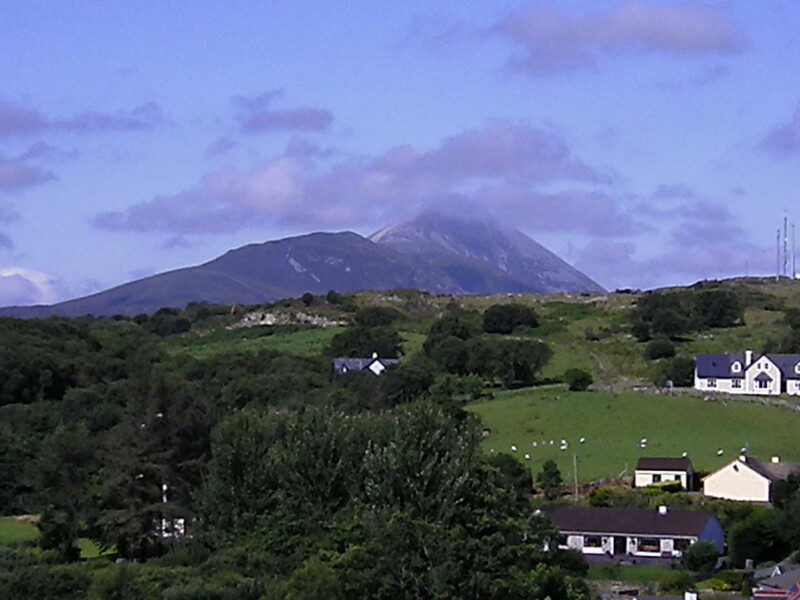 I climbed Croagh Patrick twice when I was young...never barefoot though. I love this part of Ireland. Westport House was always a favorite day-trip for us when I lived there. Matt Malloy is from our home-town of Ballaghaderreen, Co. Roscommon and I've seen him play here in Boston at The Burren pub in Somerville. Thanks for the memories! This part of Ireland is dear to me because I have family there. 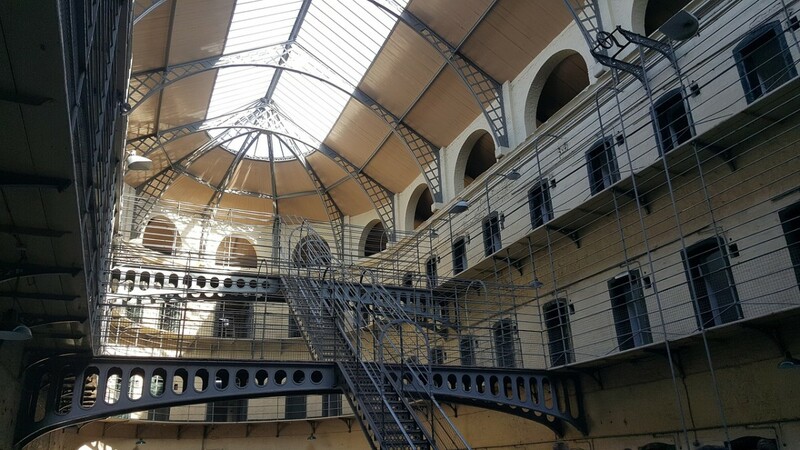 Ireland has different charms to those offered by mainland Europe, and the joy of the place is in the welcome, and in the scenery, and in the eccentricities of Irish life. I hope you do come to Europe, but you'll need to give yourself a generous timeframe to even begin to do it all justice! Amanda- Nice place. One of these days I wish to travel to Europe. Have you checked the hub from Sixtyorso about Europe travel some very good general tips over their. You're an angel. Thanks for that! Hi Amanda. Sorry. Your question got lost in the shuffle, I think. SEO is Search Engine Optimization. Basically, getting your article to be listed at the top of the search engines, and all the things you can do to help make that happen. Does that answer your question? Thanks for stopping by. I have ancestors from Cork on my mothers side. Tis true that the weather can be contrary in Ireland, but as you say, that's why it's known as the Emerald Isle! Having said that, my last holiday in Eire was completely rain free. We had fabulous sunshine for the whole week, but I guess that may have been a fluke! I love the west and sourth of Eire - my brother in Cork - but they are looking at leaving: the weather has got to them: and his wife is Irish! I guess it wouldn't be that amazing shade of green without the rain! You can't go wrong with a holiday in Ireland. Make sure you bring a raincoat, as the weather can be unpredictable, but the walking, the scenery and the hospitality are all legendary, and although I personally don't play golf, apparently the courses are brilliant as well! Amanda - As soon as I get my three kids through college I am there! You hub really makes me want to visit. Loved the video! Hi Christoph, Your avatar is looking very fetching these days! (LOL) Don't blame me BTW, as I voted for your original debonair image! 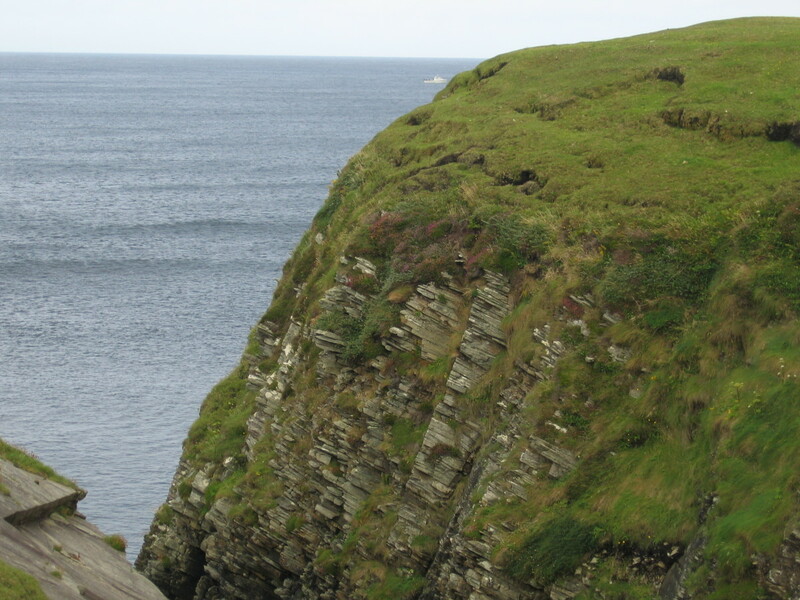 Yes, Ireland is a real gem, and you should definitely have it on your bucket list, especially with a name like Reilly. I have family in Ireland myself, and it always feels like home from home there. It certainly is a contrast Brian! The weather in Ireland too often varies between 'rain' and 'just rained'! I still love it though. Did you watch the Youtube clip? It's only very short, but it has a real flavour of happy hours drinking guinness in a crowded pub enjoying the craic and listening that wonderful diddly-dee music the Irish do so well. If there is one other place in the world that I love as much as the South of France, it has to be Ireland. I have fond memories of drinking Guiness in the pubs, trying to dance the jig and exploring the craggy coastline of the South. Great to read about Ireland and bring back a few memories even though its a bit of a contrast to where I am now. That was quick! I only published a few moments ago! Yes Ireland really is a beautiful country, and we would like to get across to see our folks there more often than we do. If you ever get the chance, do visit, as the Irish are famously welcoming. Oh, I want to see it all. My husband was Irish and told me wonderful stories of the culture and scenery in Ireland. Fascinating Hub!